As media reports have indicated, most of the ice that has accumulated in areas is beginning to thaw but there are still some slick roads out there. Our sanding crews have been busy this morning putting down sand on icy spots and other crews have spread de-icer on platforms and pathways that were slick this morning. At this time, we have had to cancel Line 51-Vista as there are too many cars that have spun out and are blocking the road. Follow developments on this and other lines at trimet.org/alerts. We thank our riders for their patience and understanding in the last 30 some hours as TriMet worked to provide safe service during this pre-winter blast. We want to give a shout out to our crews as well, especially those who were out in the conditions, dedicating themselves to safely get our riders to their destinations. And we also want to thank the media for helping get information out to our riders. We continue to encourage riders to dress warmly and check before they go at trimet.org. It looks like we are in for some frigid temperatures this weekend! Our buses continue to experience icy conditions in some areas, particularly on the east side, Gresham area and in Portland’s west hills. Lines 18-Hillside, 51-Vista, 63-Washington Park/Arlington Hts, 80-Kane/Troutdale Rd, 81-Kane/257th continue to run with chains so buses are traveling slower and riders on these lines should plan extra time in their commutes. Line 15-Belmont/NW 23rd is not serving the Thurman-Gordon Loop in northwest Portland due to ice on the Thurman Street Bridge. Our other 73 bus lines are running regular this morning. Again half of the buses out for the morning commute have the automatic drop down chains that can be deployed if needed for extra traction. MAX/WES trains are not experiencing weather-related delays at this time. Riders, it’s still quite cold. Please dress warmly, plan some extra time and check trimet.org/alerts before heading out. With temperatures hovering around freezing in many areas, TriMet crews have been out checking the conditions. There are some slick areas, particularly on the east side, Gresham area and in Portland’s west hills. TriMet crews have been sanding some icy spots in those areas. All bus lines are starting the day on regular route. We have a few bus lines running with chains for the morning due to icy streets: 18-Hillside, 51-Vista, 63-Washington Park/Arlington Hts, 80-Kane/Troutdale Rd, 81-Kane/257th. With the chains on, buses on these lines will be running slower. About half the buses in service for the morning are equipped with automatic drop down chains only. The operators will deploy the chains if they encounter areas where extra traction is needed. Only when the chains are deployed will the buses need to run slower – no more than 25 mph. These are being strategically deployed on routes that may encounter icy spots. Early morning MAX trains are not experiencing any issues. We did have a few trains running overnight to keep the overhead power wire clear of ice. WES is running regular without any issues. As it’s still very cold out there, riders should bundle up, plan some extra time and check before they go at trimet.org/alerts. All MAX lines are running, but delays remain throughout the system from continued inclement weather. Look ahead: MAX trains will run later into the overnight hours to help keep the overhead power line clear of ice. No service impacts today; no impacts expected for Friday. Look ahead: For Friday morning service, all 280 buses with automatic drop down chains will be deployed; a handful of buses will be chained to serve higher elevation routes. Crews are still assessing if additional buses will need to be chained. We continue to advise riders to dress for the cold, plan extra time and expect possible delays. Check trimet.org/alerts for the latest updates. MAX Blue and Red line service has been restored between Sunset Transit Center and Portland City Center. Riders should expect delays over the next hour as trains return to regular schedules. We thank our riders for their patience! 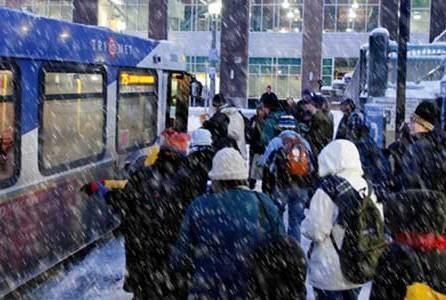 All MAX lines impacted by icy conditions and riders should expect delays. Blue Line trains are running between Hillsboro and Sunset Transit Center, and shuttle buses are providing alternative service between Sunset and Galleria in Portland City Center. MAX Red Line trains are operating only between Gateway and PDX; travelers heading to PDX should board any MAX train to Gateway then transfer to Red Line. Riders should expect delays of at least 30 minutes. Bus service is running well; nearly all chains have been removed from vehicles. We continue to advise riders to dress for the cold, plan extra time and expect possible delays. Riders may also experience crowded vehicles during rush hour. Check trimet.org/alerts for the latest updates. We continue to monitor the conditions as temperatures hover around the freezing mark. MAX trains are experiencing ice on the overhead power wire near the Sunset Transit Center, which has led to led to major delays on the Blue and Red lines. Crews are trouble shooting the issues. Efforts are still underway to remove chains from some buses. One bus line, the Line 20, is rerouted off of Barnes Road in southwest Portland due to slick conditions. TransitTracker for buses is once again showing real-time arrival predications. We continue to advise riders to dress for the cold, plan extra time, expect possible delays and check trimet.org/alerts before they head out. With the forecast changing and the threat of severe weather downgraded, we will be removing chains from our buses. We had made the decision to chain buses as a safety precaution due to the forecast calling for heavy snow, anywhere from one to seven inches accumulation. It takes about 8-9 hours to chain the bus fleet. Buses that are in service will meet crews at transit centers and key locations to have chains removed. It takes about five minutes to remove the chains off each bus, and could take more than eight hours to remove all chains. We will be switching TransitTracker for buses back to the standard arrival time predictions once most of the chains are removed, which will likely be before the afternoon commute. We will have our buses that are equipped with automatic drop down chains strategically deployed. When extra traction is needed, the operator presses a button and the chains drop down and spin under the tires. More than 40 percent of our fleet has the drop down chains. They have proven very effective in icy conditions and in less than six inches of snow. We also have some buses at our garages that will remain chained until they are scheduled to go out for the afternoon commute. If the chains are not needed, crews will quickly take them off before the buses head out. Heated equipment on MAX trackway and trains is in use to keep the system moving. WES did not experience any delays this morning and MAX continues to have no weather-related issues. We will continue to monitor conditions and will make adjustments if necessary for safety to either train or bus service. We continue to encourage riders to bundle up and check trimet.org/alerts before they head out. It’s remains cold out there. We are hearing some reports of icy spots out on roads but as our buses are all chained up we are not seeing any issues. Again, we want to remind riders that chained buses are running slower so they should dress warmly and plan extra time. Also, sidewalks may be slippery so we encourage them to be cautious. Riders should check before they go at trimet.org/alerts. MAX and WES trains are running smoothly at this time. We continue to monitor the weather and the travel conditions and will adjust service for safety if necessary. As the storm moves in, we have crews throughout the area monitoring conditions. Currently, we are not experiencing any major issues on bus routes, and MAX and WES trains are running on regular schedules. As a precaution due to the forecast and the uncertainty of the intensity of the storm, anywhere from one to seven inches accumulation, we sent all buses out this morning with chains on. Chained buses cannot go faster than 25 mph so buses will not be on schedule. Riders should dress warmly, plan extra time and be prepared for delays. They should check before they go at trimet.org/alerts. TransitTracker for buses is reporting miles away to help riders better estimate when their bus will arrive because arrival time predictions are not as effective when road conditions worsen and buses are running slower. Our 503-238-RIDE call center will have extended hours, opening at 6:30 a.m. to help riders with their trips. Riders can also sign up for email updates on service adjustments by going to trimet.org/emailupdates. TriMet and our transportation partners are preparing for the possibility of heavy snowfall tomorrow. Based on the latest forecasts, all TriMet buses – including those equipped with automatic drop down chains – will go out Thursday morning with traditional chains. This means buses will be running slower and not on schedule. We want to get riders to their destination safely. While TriMet staff has worked with our partners to identify priority streets for snow plowing that include our busiest bus routes, our main principle during inclement weather is safety over schedules. If it’s not safe for our riders, our operators, or our equipment, we will alter service. That may mean adjusting a bus route, putting it on snow route or cancelling it altogether. While more than 40 percent of our bus fleet is now equipped with automatic drop down chains, they may not be as effective as needed in heavy snowfall of more than six inches. So as of 4 p.m. Wednesday, we are planning to have all buses chained up for the start of service Thursday. Buses with chains cannot travel more than 25 miles per hour, which means buses will not be on schedule, but the aim is to keep the buses running at regular intervals. In addition to preparing our buses for winter weather conditions, crews are also turning on all heated equipment to keep MAX running. This includes heaters on track switches and the equipment that runs along the overhead power wire in an attempt to keep it clear of ice and snow buildup. It’s important that riders dress warmly and expect delays. Riders should check trimet.org/alerts before they head out. Our 503-238-RIDE call center will have extended hours, opening at 6:30 a.m. Riders can also sign up for email updates. Plan extra time as there will likely be delays. Get more tips at trimet.org/winterweather. TriMet operations managers will continue to closely monitor the storm and we will have TriMet crews out early in the morning checking conditions on our bus and MAX lines. We will adjust our service plan as needed and appreciate our riders understanding.